Ok, this is my first time in a long time that I have been in an airport without lounge access. But you know what, it’s not that bad. I am sat comfortably in a nice food court with a splendid view out onto the pad. The variety of food is extensive and not that expensive. Ok it’s not free like in the lounges, but the selection is way, way better and so is the view. There is plenty of seating, with a nice hastle free atmosphere. The seating isn’t much different to that available in the lounges (unless you are travelling First Class), and in many respects is actualy better. I have always found the lounges here in HIA to be dark and depressing. It’s light and vibrant here in the food court. As regards food, there are many options. Pasta, noodles, sandwiches, pizza, Burger King etc. And I have just spotted a very decent 6 item breakfast for QR 26, although that wasn’t in this food court that was in a restaurant called Marche. You would need a second mortgage to afford a breakfast in Heathrow. Burger King here is excellent value with a Double Whopper Meal costing just QR 29 (USD 7.97). Not much more than the high street in Qatar. The shopping in the HIA is excellent with plenty to keep your mind busy while you wait for your gate to open. The thing is I used to turn up here, and go direct to my lounge and stay there until my gate was open. And that was a huge mistake. Man I used to get so bored. Down here there is much more to do and see, the food is better and it’s much more spacious. I’m not missing the lounge at all today. I lost my lounge access because I haven’t flown enough this year to re-qualify for Qatar Airways Silver Membership. And although my Qatar Airways co-branded Mastercard gives me free lounge access throughout the region, incredibly it doesn’t here in Qatar. How crazy is that? And I found my Priority Pass to be a waste of money on the routes I am flying. Right that’s enough about HIA, next blog will be from Manila while I am killing time in Terminal 3. Well all good things must come to an end. And the free parking enjoyed in the HIA long stay has ceased to be. Unfortunately it’s a little more expensive than I was hoping for. QR 2 per hour, and QR 45 per 24 hours. 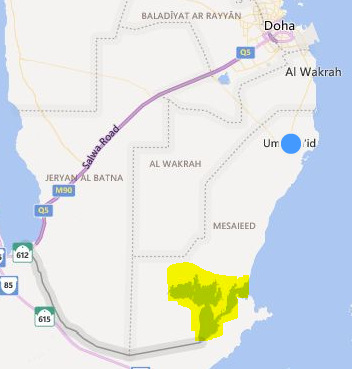 I’m planing a 10 day trip soon, and that would cost me a massive QR 450 while I am away at QR 45 a day. And that stings just a little too much for me. Of course I could just do what these guys are doing and park on the road. The cars in these images are all parked. You are not looking at a stream of traffic frozen by my camera, they are all driver-less. They have all parked on the road and walked in I guess. But I will probably just take a cab. Which is what I guess a lot of other people are doing as the long stay car park is looking very shall we say empty these days. When it was free it was really well used, and there were no cars parked on the roadside. A more reasonable price would have been a better option in my honest opinion. It’s a fabulous facility, with lots of security roaming around and air conditioned shuttle bus waiting rooms. Just a little too pricey for me. Which is good news for the taxi companies. 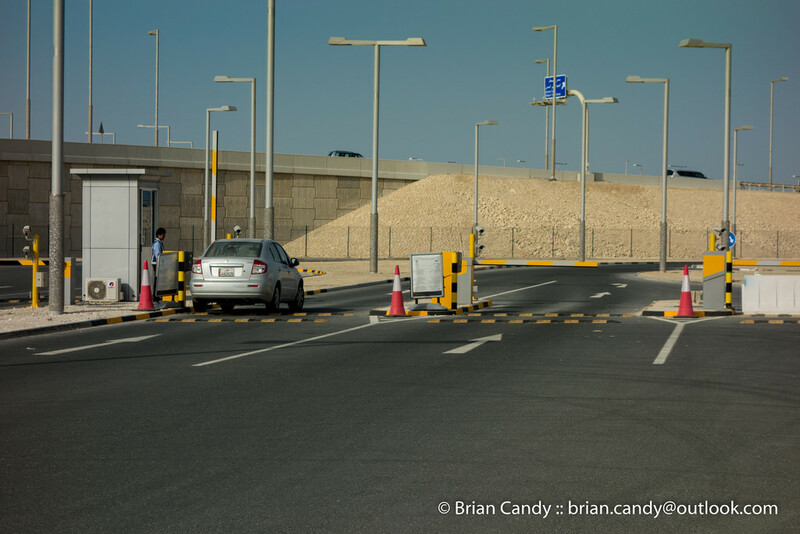 Oh and if you plan to pop along to check out the car park in advance of travelling, be aware once you drive in, it’s QR 2 even if you come straight back out. My 6 minuet stay was QR 2, which I didn’t mind paying to find out how everything works and grab these images.